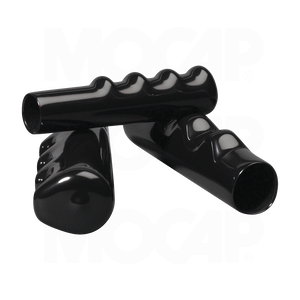 MOCAP Dip Moulded Finger Nub Vinyl Plastic Grips not only improve appearance but also provide a secure comfortable grip on items with handles or levers. Our round finger nub vinyl grips are available in a variety materials, colours, hardness durometers (soft, semi-rigid or hard), and diameters to fit your application. Choose from our many material options including our traditional smooth & glossy vinyl plastic or rubber-like textured vinyl plastic material. Flexible but durable vinyl materials can stretch onto slightly larger dimensions for a snug fit without splitting, tearing or shredding. All MOCAP round grip materials are tough, weather resistant and attractive. Custom moulded hand grips can also be produced with minimal tooling costs. Also available: round vinyl grips to fit 4.8mm (3/16) 214.0mm (8.42") diameters. Most vinyl plastic caps, plugs and grips can be imprinted with your company name, logo or message. Consider MOCAP's Double Dip process which allows you to combine various colours, formulas and textures to produce a unique product and improve overall appearance.